1. Preheat oven to 350 degrees F (325 degrees F with convection). Cover a cookie sheet with wax paper. 2. Heat olive oil in a large saute pan on medium heat. Add onions and stir around for a minute. Add scallions and garlic, stirring for another minute. 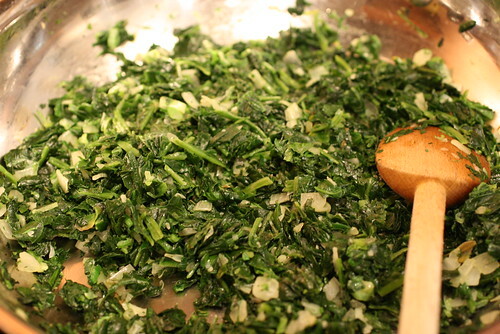 Add parsley and frozen spinach and stir until there are no frozen pieces and it is all evenly heated. It should be dry. Remove from heat and allow to cool. 2. 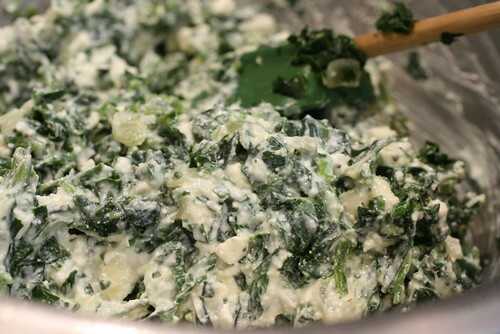 In a large bowl mix together ricotta, feta, and spinach mixture. Season to taste. 3. 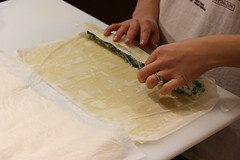 When you work with phyllo, you have to work quickly. Always cover any sheets you are not using with a wet paper towel. 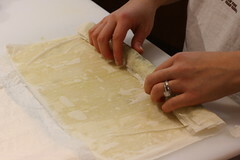 Lay one sheet down, brush with olive oil. 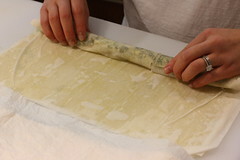 Lay another sheet on top, brush with olive oil again. 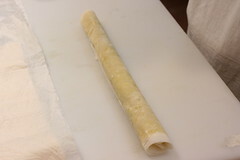 Repeat until you have a total of 4 sheet, without olive oil on the top layer. 4. 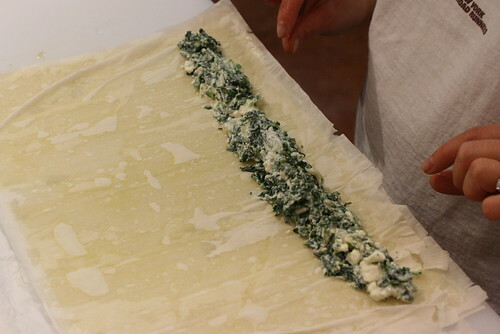 Form a log of spinach and cheese mixture along the length of the phyllo, a little bigger than 1″ in diameter. 5. Roll it up. When you get to the end, brush a strip of olive oil to seal it. 7. Repeat steps 3 through 6 until you have 7 rolls. Place them on the cookie sheet with wax paper. Bake for 18 minutes or until golden. posted by jessica	at 02:20 PM	Filed under Mediterranean, Recipes. You can follow any responses to this entry through the RSS 2.0 feed. Both comments and pings are currently closed. 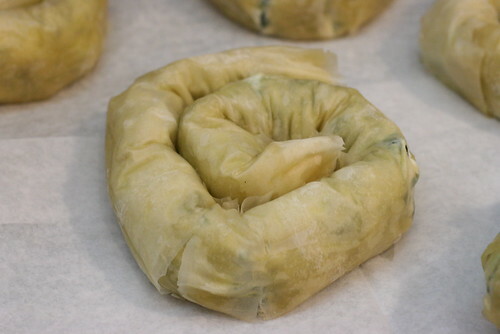 These look so pretty, I love spanikopita, this looks like a similar concept in roll form! Wonders, phyllo is fun. You can try filling it with anything. If you use meat, cook it first and make sure it’s not too wet. Very pretty–what a nice idea! Oh, I’ve never thought of doing that shape! Nice. 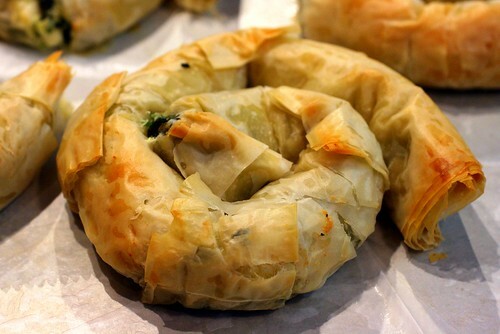 I’m learning more about phyllo. These are gorgeous. 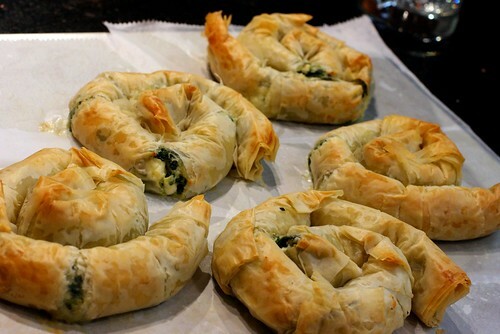 Those rolled spinach pies look so good! leave out the ricotta and this is pretty close to a bulgarian dish called banitza! in fact it is one of the national dishes! Bulgariandude, cool! I would love to try some Bulgarian food!